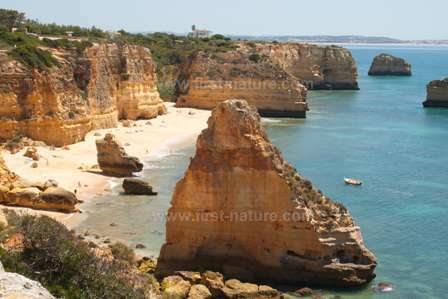 The fabulous weather and magnificent coastline of the Algarve has justifiably given the region a world-wide reputation as the perfect holiday destination. Many visitors come to enjoy the vast stretches of sandy beaches, the renowned golf courses, or simply the warm sunshine and cloudless blue skies. 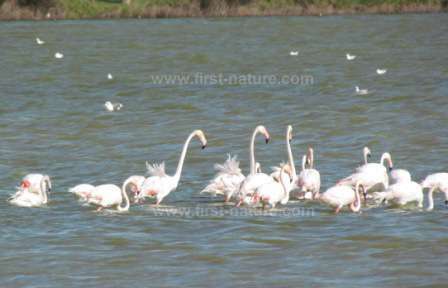 There is another side to the Algarve, though, and it is one equally well known and loved - it's unique natural environment - and many visitors come to take advantage of the special opportunities here to enjoy the birds, plants and other wildlife that share this lovely place with us. Some visitors - myself included - love this part of Portugal so much that they make their homes here, spending all or at least a substantial part of their time in the Algarve. Many become involved with the local conservation organisations whose aims are to protect and preserve this special place and its natural resources. This section of the Algarve Wildlife website celebrates the work and achievements of some of the individuals and organisations who strive tirelessly to protect the natural world of the Algarve, either through hands-on conservation work or by providing opportunities for natural history education for schools and information to help interested visitors to get the most out of their time in the Algarve. Some of these people and organisations work actively with the Portuguese governmental bodies to ensure new villa, hotel and other tourist developments are both environmentally sustainable and in harmony with the natural world. With increasing economic pressures this work can be difficult and complex. As we launch this new section of the website, the debate about the highly controversial development of Praia Grande at Salgados, the last undeveloped stretch of the coastline below Silves, rumbles away in the background of our day-to-day lives in the Algarve. On the one side is the development company, whose latest attempt to appease the conservationists is a proposal to include a 'nature park' which they say will protect the sensitve habitats and nature of the area. These habitats include a stream estuary, sand dunes, a lagoon, saltmarsh and a fossil cliff, and some of these are already the subject of conservation measures because of their unique natural features and wildlife. 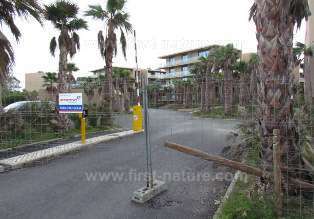 The investment that the developers propose to spend on the so-called nature park is one million euros. This tells us a lot about the extent of the work that the development company is prepared to carry out to preserve a vital part of the natural heritage of the Algarve. Anyone who knows anything about the cost of protecting sensitive eco-systems and their species and then to continue with the programme of maintenance essential to retain such an area in good ecological condition will know that one million euros is a paltry sum with which to achieve even short-term conservation goals. Large scale developments with small-scale mitigation for loss of habitat cannot succeed. It would be interesting to hear what proportion of the overall investment in the tourist development one million euros represents. Habitat conservation always requires ongoing management, and that means an ongoing commitment to continuous investment in order to ensure that subsequent stages of the development do not undo work carried out to protect the environment from the earlier phases. Many people must be suspecting that neither the money nor the so-called conservation work is additional but rather money planned for exsisting elements of the project but now being redefined in an attempt to appease opponents. Struggling for suvival - CS Palm Village Resort at Salgados - how much more of this does the Algarve need? Like all the world's governments, including the one in Britain, the Portuguese Government has to manage the expectations of a population battered and bruised by the failures of... well, earlier government policy, surely. Also, like many other beleagured European governments, the Portuguese see only one route to prosperity and that is to commit to more of the same old policy that got us into trouble in the first place. We hear of 'building developments' and ' tourist developments' when, if they had learned anything at all from the mess we are in, we should be hearing about 'sustainable developments'. We need projects that will earn money not only in the short term but also, crucially, in the longer term. What we do not need are any more projects that simply involve spending money creating short-term construction jobs but which then collapse in ruin and disaster both for the people who live here and for the environment they live in. The Algarve is littered with mothballed or abandoned construction sites, including one immediately adjacent to the proposed Praia Grande development. No doubt the developers involved in that earlier project provided the same glib and superficial answers that the Praia Grande developers are offering to a concerned public who see the potential for another major environmental disaster in the Algarve should this new project fail. This time the consequences of failure might not be just one more abandoned building site; it could be the wholesale destruction and permanent loss of one of the few ecological gems left in the Algarve.